Sue Shanahan created this beautiful holiday card to commemorate the unexpected passing of her nephew TJ, 17 years ago at the age of 23. Her holiday cards are sold to raise money for a scholarship fund formed in TJ’s name. To date over $150,000 has been dispersed to children and young adults, especially to those with learning disabilities. For more on Sue and her cards, see her website. Here is Sue’s remarkable story of her nephew’s death. TJ, a child of the foster care system, came to my sister Laura and her husband Bob when he was 10 years old, seemingly by accident. Laura, a social worker, was called by TJ’s caseworker to see if they could take him for the weekend on emergency. They did, and his stay stretched from weeks to months until they knew he was there for good. TJ had come home. TJ struggled in school. He had profound hearing loss in his left ear and a learning disability that made it difficult to read. Laura shared her love of books by reading to him every night. That, along with exceptional teachers, helped TJ to blossom in his school studies. By the time he reached high school, he was an accomplished athlete. He excelled in football and wrestling. When it was time for college, TJ went to Eastern Illinois University on a wrestling scholarship. In 1996, his senior year of college, TJ and his friends had gathered at a park to celebrate completing their final exams. A warm spring day, some of the kids decided to brave the swirling river and jump in. The water was especially treacherous that year because of an abundance of rain in the previous weeks. My nephew, always a lover of risk, was able to jump in and get back out. On his second try, the current pulled TJ to the spillway while he struggled to keep his head above water. His friend Joe attempted to save him, but they were both pulled under. By all accounts the boys perished around 4:00 PM that day. of what she saw sent a small wave of fear through her. Could the angels mean something horrible had happened? Only later, when the shock began to fade, were Laura and Bob able to connect the time of their son’s passing with the angelic appearance. Some may say the heavenly visitors appeared at the exact time of TJ’s passing by Divine appointment. What better way to help ease his little sisters’ pain then by letting them know their brother and his friend were in heaven? Bob looked at it more as TJ personally reaching out to Molly and Elyse. He was glad his son had thought of the girls and made the effort to connect with them as he passed from this world to the next. 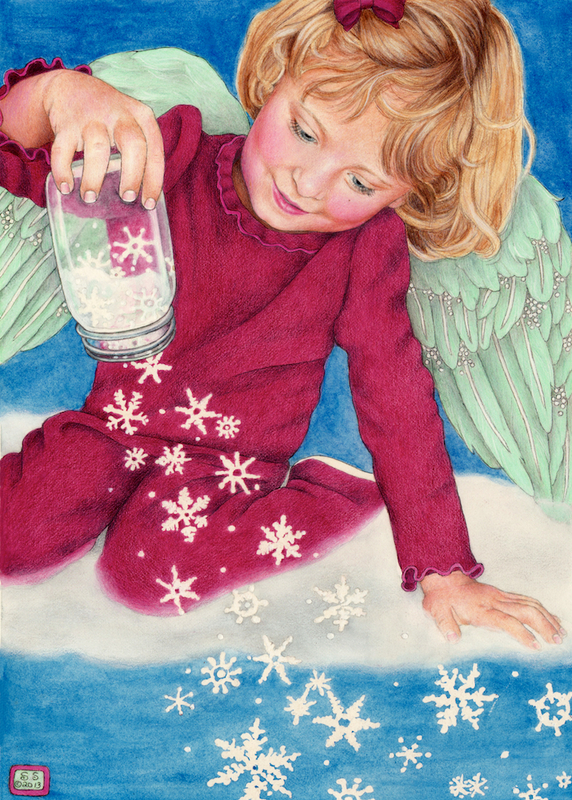 Every year I incorporate an angel in my card design to remind us that although no longer in the physical, TJ is always with us. Death isn’t strong enough to extinguish his bright light. TJ brought much joy to the world. He was smart and loving and creative and kind. Yet, at the same time, he could be moody and selfish and inconsiderate. After he died, found among his things was a list he compiled to inspire himself in his goal to be an All-American wrestler. At the bottom of the page he wrote, “It is not where you start. It is where you finish.” As a child he endeared much sadness and neglect before he landed with my sister and her husband. From a rocky start, he accomplished much. He was perfectly imperfect in his humanity. And anyone who was lucky enough to know him wouldn’t have wanted to change a thing.